Universal USB Installer 1.9.8.5 - adalah aplikasi yang membantu anda untuk mencipta bootable USB Flash Drive daripada senarai Linux Distribution yang tersedia. Ianya amat mudah digunakan. 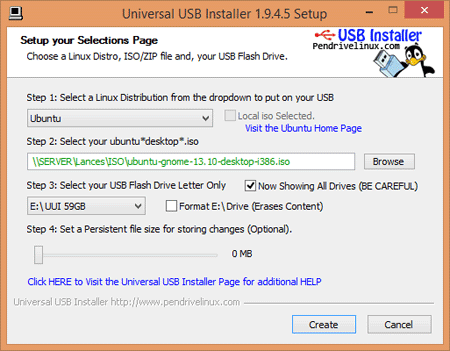 Anda hanya perlu pilih Live Linux Distribution yang hendak dimasukkan dalam USB Flash Drive, kemudian browse ISO file, pilih drive letter dan klik Create untuk menghasilkan bootable USB Flash Drive. Set Fat32 and NTFS Format options to format only the selected Volume Drive Letter. Include a new option to Wipe Entire Disk (including all attached Volumes/Partitions). 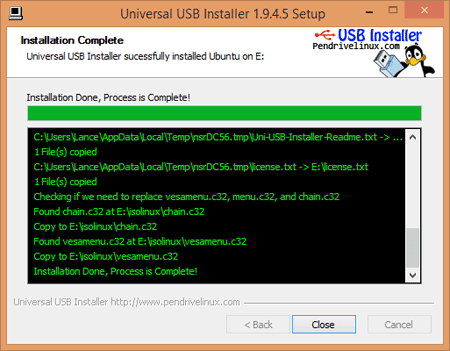 The Wipe Entire Disk option can be used to Restore USB drives made bootable with DD, or to convert them back to use a single partition with a bootable MBR.